What do parents say to their three-year-old daughter that refuses to ask Santa for anything except a real horse -especially when they are a middle-class family living in the city? Clearly, Santa’s sleigh is not big enough to bring everyone a pony. After sharing that grown up wisdom, we told Camber that if God had put that dream in her heart, He would give her that horse. And with childlike faith she began to pray every night for that horse. Five years later, we had moved to Wichita, Kansas and Camber was taking horseback riding lessons from our insurance agent’s wife. 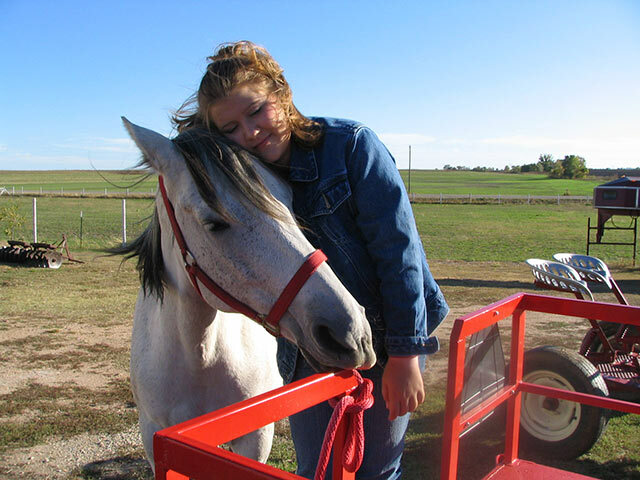 After talking Paul into purchasing two one-dollar raffle tickets to win a horse at the EquiFest, Camber came bounding inside, plopped down on the couch, and announced with 100% absolute faith that the horse on her flyer was her horse that God was going to give her – even looked like the horse in her dreams. Being the awesome parents we were, we immediately helped her to understand, “No one ever really wins those things. Do not be discouraged if you do not win…everything we could think of to protect her dream.” A few months later, at the EquiFest, God gave Camber the horse she already knew was hers. And she still owns her today. A couple of weeks later, while I was doing her hair for school, Camber matter-of-factly announced, “I know why God gave me my horse. He wants me to have a horse farm and help kids who don’t have good parents and special kids.” While I stood speechless trying to wrap my head around the bigness of the way God was developing His own relationship with my little girl, I had no idea that He was preparing Camber, Corbin, me and Paul for a time and place 14 years later where all of our life journeys would collide into one perfect story that would make everything make sense. 10 years earlier, when our first and only precious son took his first breath of life, Paul and I took our first step into the most amazing world of autism. When they told us Corbin had a 25% chance of life in the next 72 hours, we prayed like crazy. We told our beautiful, perfect, preemie baby boy that if he would fight for his life, we would fight for him the rest of his life. Not one of us locked in that moment in time had even the tiniest ounce of understanding what any of that really meant. Corbin is, and always has been, one of our biggest heroes. He is a strong, amazing and extremely intelligent young man. He taught himself to read using numbers and letters. He is so gifted in things like fixing equipment, working on engines, etc…with no instruction from anyone. He has the most soft, gentle heart, and his beautiful blue eyes see this world completely different than we do. He is exceptional and his world is extraordinary. He has taught our family that we all have special needs – and ours was to learn how to adapt and understand that this world is so much more that what we had the ability to appreciate. He did not allow us to stay in our little box. Our son has challenged us to look deeper, see bigger, love larger, accept wider, and trust our God further – all in his act of love toward us, allowing us into his profound, brilliant, fascinating world. We are still on this journey today, and we are blessed.